Saturday, March 22. 10:00 AM start. 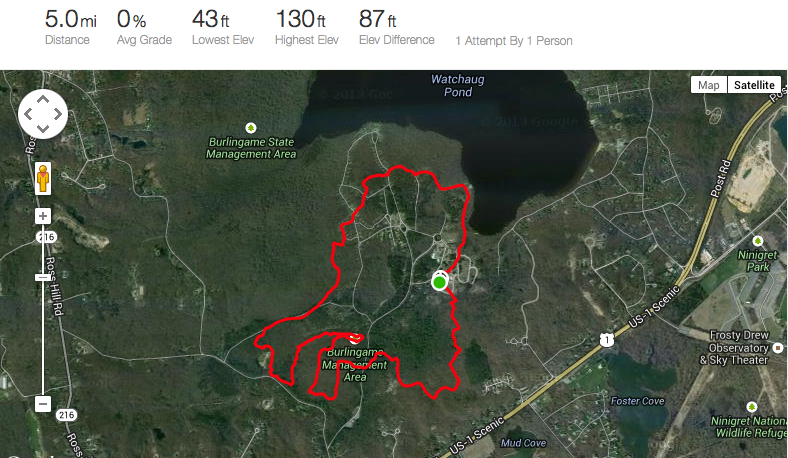 This year's Brrr-lingame course will feature a 5 mile singletrack loop. The feature race will be a two lap 10-mile event, but there will also be a single lap 5-mile option for those not wishing to do the longer distance. All runners will start together. The race starts and finishes in the campground area of Burlingame State Park. The trails are generally fast hard-pack, but several short steep hills, a few bog bridges, as well as February conditions will all challenge racers. Prizes for top overall, age group, and team winners (based on top three finish times). General prize raffle for all participants following awards. Race #4 of 5 in the SC 4th Season Race Series. Series championship points will be awarded to top 6 overall places for each gender, top 3 places for each age group, and top 4 teams. Series points will only be awarded to 10-mile race finishers. Exception: runners in the 1-10, 11-13, and 70-79 age groups can collect series points for competing in the 5-mile option. $10 preregistration per entry, Families of 2 or more pay only $20. Tuna/Other canned meats - like PB&J, need for lunch foods increases during vacation. Cereal - also in high need over break. Donation items will be collected and delivered to The Jonnycake Center of Peace Dale. Register day of race at Burlingame State Park. Registration opens at 9:30am. Race day registrations are $15 per entry; $30 for families of 2 or more. Refreshments will be available immediately following race. Awards and raffle to follow as finish times dictate.